Open the Microsoft Paint application. Click on the 'Start' menu bar on your desktop. Next click on 'Programs' option and go to 'Accessories'. Now click on the option 'Paint' which displays in the 'Accessories' list. Click on the 'File' option given on the top left hand side corner of the application window. Next click on the 'Open' option from the list that displays after clicking on 'File'. Navigate to where you have stored the image. When the folder window opens, choose the image file. Note: After opening the file, you will notice that there are eight dots around the whole image, placed on the border of the image. One dot at each corner of the image and one dot in the center of each side of the image. These dots can be used for shrinking/resizing the image, using your mouse (explained further below). In order to select the area you require, choose the rectangular select tool from the tools given on the left hand side. After choosing the rectangular select tool, place your mouse at the starting point of the area in the image which you would like to select. Click once on that point and while keeping your mouse key pressed, move the cursor in the right direction and then towards the bottom till the area you require gets selected. This action will draw a rectangular area on the image. Note: Make sure that the vertical size (height) of the selected area is more than the horizontal size (width). Now leave the mouse button. Once the area you require is selected, right click on the selected area to display an options list. Select the option 'Copy To' and navigate to the folder where you want to save the selected portion of the image. Give a name to the new file and click on save. Now open the new file that you saved by repeating steps 1 and 2, given above. 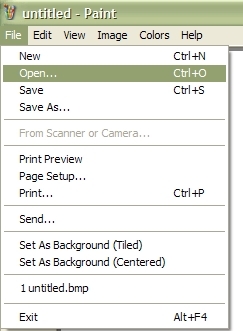 After opening the new file, click on the 'File' option given on the top left hand side of the window and then click on 'Save As'. 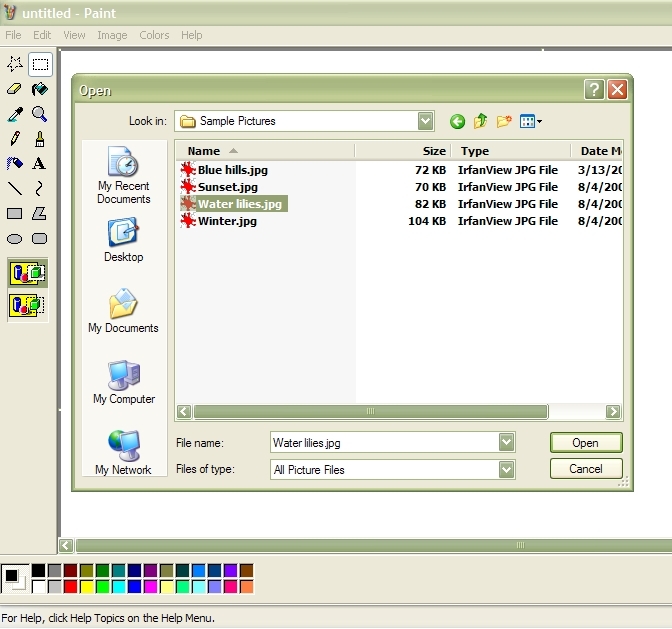 In the resulting window choose the 'JPEG' format in the 'Save as type' option given below the 'File name' option and click on the save button. This will save the cropped image in the format which is accepted by us. Once you save the image in the correct format, check the dimensions (width and height) of the image. It should not be more than 150w x 200h. If the image is bigger than the required dimensions, follow the steps given below to resize the image. a. Checking dimensions of the image. 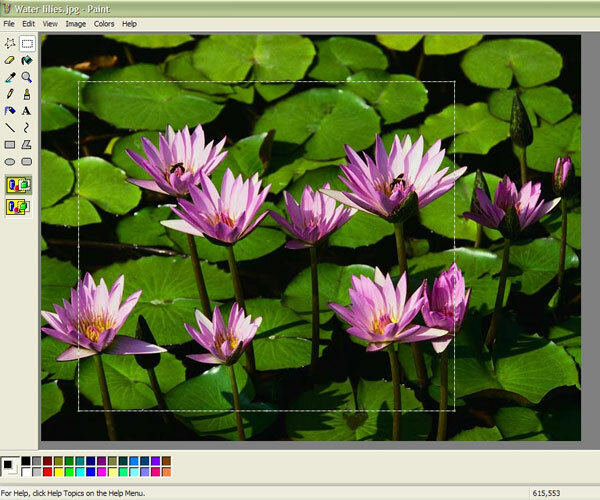 b. Resizing image using 'Stretch and Skew' option. Note: While adding the values of stretch option, make sure that horizontal and vertical percentages are equal, in order to maintain a proper proportion of height and width of the image. c. Recheck the dimensions/attributes of the image by repeating step 8(a). d. If there is a minor difference in the edited image and the required dimensions (150w x 200h) then crop the image a little by moving the right most bottom corner dot diagonally upwards. This action will reduce/crop the image from the right hand side and bottom. Optionally you can select the whole image by going to the 'Edit' option given on the top left hand side and choosing the 'Select All' option and then moving the image as shown below. When you click on this option, the borders will become dotted and when you move the cursor on the image it will look like a '+' sign. In order to crop the image, click on the image and while keeping the mouse click pressed, start moving the image in the direction as shown in the image given below. This action will crop the image from the left hand side and top. 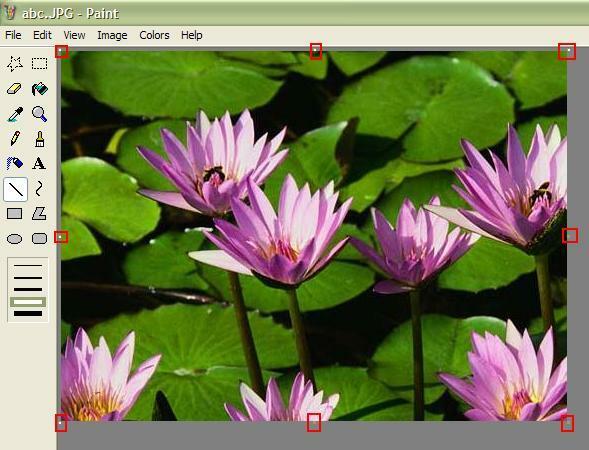 Once the image is cropped from left and top, leave the mouse click and then click once, outside the area of the image. This action will remove the border outside the image. After cropping, some white space may have developed in the image, to remove the white area, move the dots again as shown in point 8(d)'s first figure. Once you get the desired results and the image is resized/cropped as per the required dimensions (150w x 200h), save the image, upload it and then submit it along with the registration details.